I admit it: mysteries, crime procedurals, and courtroom dramas—with their rote formulas and seemingly predetermined outcomes—tend to trigger my yawn reflex. I prefer stories with characters less bound by the strictures of narrative destiny. It may only be an illusion concocted by a clever writer, but I need to believe a character can at any moment do something that will surprise me, turn the story on its head, or at the very least make me believe the conclusion isn't preordained. And, with apologies to Columbo, TV murder mysteries are about as predictable as it gets: someone is killed, the hero investigates, and, by way of wits and the overcoming of obstacles, the killer is apprehended—all within a neatly wrapped hour. Except by that point I've usually reached for the remote. But then I got my first glimpse of Miss Phryne (pronounced Fry-nee) Fisher. Sleek and mischievous behind glossy lipstick and jewels, brandishing a pearl-handled revolver and bright blue eyes and that fatal Louise Brooks bob, she made me forget all about my impatience with overly ritualized storytelling. Flappers with perfectly structured cheekbones trump snobbery every time, leaving me little choice but to spool up the first episode of Miss Fisher's Murder Mysteries. It would take more than intense aesthetic curiosity (yes, that's what I'm calling it) to keep the show from dropping to the bottom of my Recently Watched list, however. And it turned out there is more to this Australian production, based on a series of books by Kerry Greenwood, than passably plotted whodunits, perilous scrapes, and a spirited heroine of independent means. Certainly those elements form the core of each episode—and are ably served by a lavish production budget that allows for drool-worthy costumes and on-the-nose period detail. 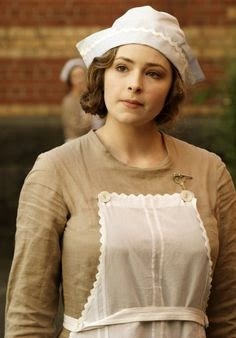 But the show's anchor is the ongoing relationships among the appealing and well-defined group of characters who comprise Miss Fisher's iconoclastic support network. 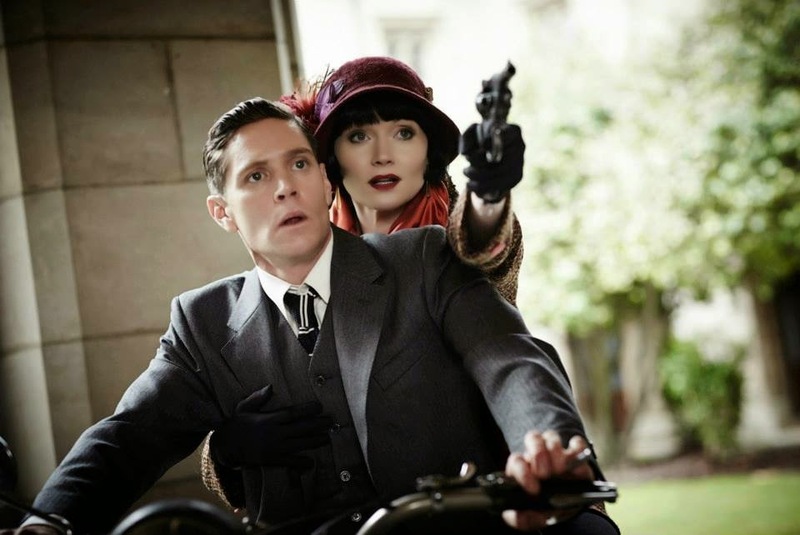 There's Detective Inspector Jack Robinson, Melbourne's no-nonsense investigator who is at first annoyed by Miss Fisher's meddling but slowly warms to her (both professionally and personally); rookie Constable Hugh Collins, whose eagerness to aid Phryne stems partly from his crush on her ridiculously adorable and naive assistant, Dot, whose strict religious upbringing often puts her at odds with not only detective work but her own emotions; Miss Fisher's parchment-dry butler—named, of all things, Mr. Butler; and a hotheaded pair of drivers who keep their employer in touch with life at street level. 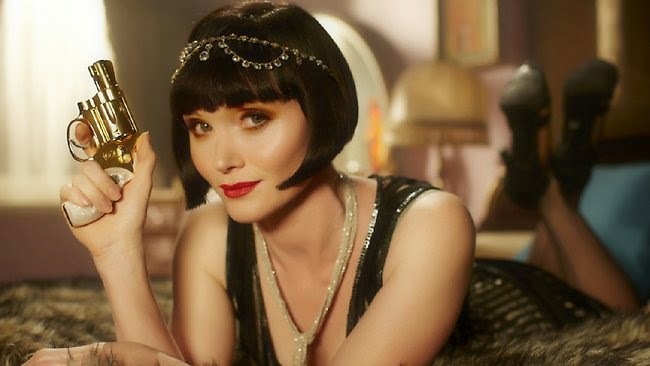 But the real wonder of the show, as one would hope, is Miss Fisher herself, whose carefree self-assurance (she sleeps with whom she wants, when she wants), resourcefulness, and elegance are effortlessly embodied by actress Essie Davis. Mostly unknown outside of Australia and the UK, it's easy to believe Davis is Miss Fisher, so fully realized is she beneath Phryne's iconic bob and luscious 1920s wardrobe. (In photos of her in more modern roles, she seems strangely incomplete.) Producers Fiona Eagger and Deb Cox struck gold when casting her, as without the right actress to personify the strength, intelligence and flat-out skill set of her character (who sports a wide array of hidden talents), Miss Fisher would be less believable both to us as viewers and to the 1920s-era characters who must contend with her occasionally radical modernity. Expressing various shades of shock, disbelief, and impatience at Phryne’s refusal to play by the conventions of her gender, those characters, who represent the limitations and contradictions of their time (as do we all), come to realize she’s not only as capable as any man, but offers far more than the allure of wealth and beauty. Certainly Phryne knows—and has suffered by—society's rules. But she also knows how to adroitly circumvent them when a flirtatious smile, a fiver, or a pearl-handled revolver won't do the trick. Much of the show's fun comes from discovering not only the practical obstructions to solving a murder in 1920s Melbourne, but the societal ones, which can require just as much cleverness to crack. It’s not enough that Miss Fisher and her team need to determine who put bleach in the victim's Digitalis or who's leaving sawdust at the scene of every crime, but how to simultaneously gain access to people and places (and mindsets) traditionally off-limits to the poor, rich, or female, depending on the case. As a result, each episode's solved crime comes with a shaft of enlightenment to characters being exposed, often for the first time, to concepts like female independence, homosexuality, spousal abuse, child welfare, and recreational drug use. Without once standing on a soapbox (and often leading by example), Miss Fisher ever so delicately suggests that the established order may be in need of improvement. It’s always tricky introducing a modern sensibility to stories set in the past: there's the danger of becoming preachy, flaunting present-day hindsight, or turning the main character into a virtual time traveler. Miss Fisher’s creative team seems acutely aware of this, maintaining its subtly progressive—and unapologetically feminist—tone while letting the show's wit, production design, and character dynamics supply the necessary spoon of sugar. Whether you're a mystery buff, a fan of witty period adventures, or just a superficial type with an eye for flappers, Miss Fisher's Murder Mysteries should satisfy whatever sweet tooth you have. I'm glad to see your article about Miss Fisher's Murder Mysteries. I absolutely love this show! I'm an American male and I couldn't enjoy this show more. Like you've written, it's not your boring courtroom drama, nor is it the same cookie-cutter police shows that you always see. It's just a wonderful show and the characters are great. Miss Fisher is almost like an Ernest Hemingway character. Driving an ambulance in World War One, or flying an airplane. You mentioned Dot. You have to love a character who's afraid to answer the telephone or use electrical appliances, because her Priest told her that, "It's unnatural putting electricity through wires. Sooner or later it'll come in contact with the molten center of the earth and blow up the whole world!" That's just great. They haven't announced a 3rd season yet and there is a petition on CHANGE.ORG for another season of Miss Fisher's Murder Mysteries, so if you want to keep a great show going please go and sign it.